Author Felix Palma has written a fast-paced, imaginative and exciting adventure set in Victorian London. It’s part science fiction, thriller and romance. Readers won’t be able to put it down! 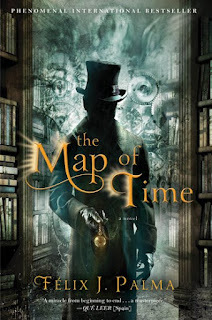 Book Summary: Set in Victorian London with characters real and imagined, THE MAP OF TIME boasts a triple-play of intertwined plots in which a skeptical H.G. Wells is called upon to investigate purported incidents of time travel and thereby save the lives of an aristocrat in love with a murdered prostitute from the past; of a woman bent on fleeing the strictures of Victorian society; and of his very own wife, who may have become a pawn in a 4th-dimensional plot to murder the authors of DRACULA, THE TIME MACHINE and THE WAR OF THE WORLDS, in order to alter their identities and steal their fictional creations.